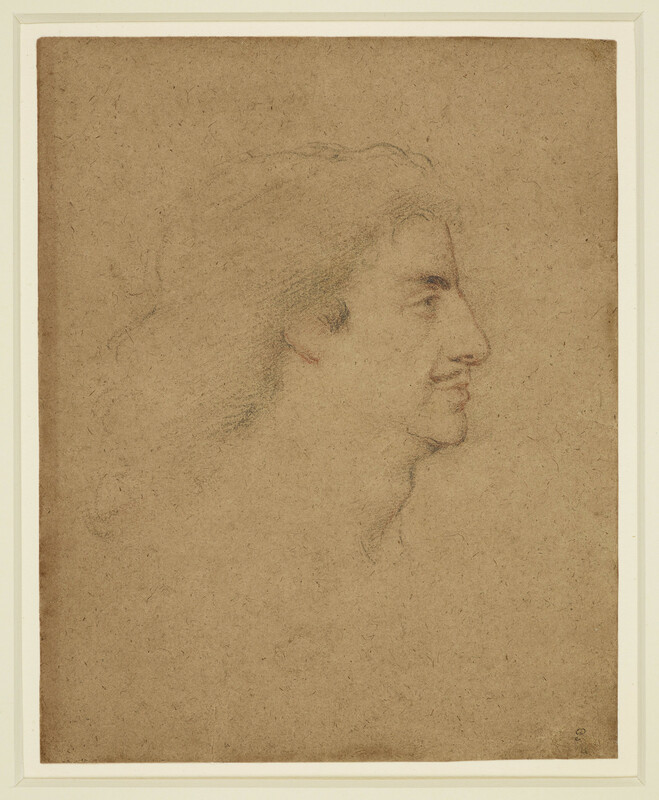 A portrait drawing of Charles II; his head only, turned in profile to the right. Charles II was Samuel Cooper's most assiduous patron and lost no time in sitting for him soon after the Restoration. This drawing is associated with an account in John Evelyn's diary for 10 January 1662 in which he recalls: 'Being call'd into his Majesties Closet, when Mr. Cooper (the rare limner) was crayoning of his face & head, to make stamps by, for the new mill'd mony, now contriving'. An alternative to Evelyn's dating suggests that the drawing was produced in June 1660, in preparation for new coinage to replace the Cromwellian coinage; giving the people tangible evidence of the king's power was of paramount importance. A manuscript note adhered to the verso of the drawing's mount, in the hand of a previous owner, Jonathan Richardson the Younger, supports this being the product of a sitting in 1660, stating 'This Drawing is the portrait of King Charles II for his Inauguration Medal; and for which he sate (as I have heard my father say) the very same day He made his Publick Entry through London; to Loose no time in making the Dye'. The drawing shows that Charles II looked older than his 30 or 32 years. This had been remarked upon throughout his life. The hardships and uncertainties of Civil War and exile must have contributed to his premature ageing, with Pepys commenting in November 1663 that the king's hair was 'mighty gray'. There is another very similar drawing by Cooper in the Royal Collection (RCIN 914039), and it is not certain which is the prime version.